If you buy or bake BBQ pork (Cha Shao 叉燒) and can’t finish it at a meal, you can save it to bake this beautiful BBQ pork buns (Cha Shao Bao 叉燒包). 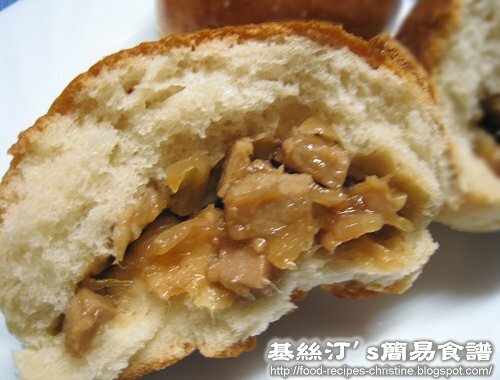 Most Chinese restaurants have baked Cha Shao Bao available as dim sum (點心). The BBQ pork inside the buns is so juicy and succulent. You can’t miss it if you haven’t tried it before. Mix all ingredients for buns except plain flour together (picture 1). First, put sugar in hot water, let sugar melt completely. Add milk and oil, mix well. Allow cool to 40C, add yeast and stir well. Coat a cotton towel for 10 minutes and let it rest. Then the mixture would become something like the picture 2 shown. Add sifted plain flour into the mixture, mix well (picture 3). Knead dough until not sticky to hand. Cover with a clean cotton towel for 25 minutes. The dough will be more than double in size. Bake for 15 minutes at 200C and brush with egg yolk, then bake for another 5 minutes. Brush with syrup (sugar in water). Cut cha shao, shallots, onions into small cubes. Add oil into wok on medium heat, sauté onion, shallots until aromatic, put in cha shao and continue to sauté. Pour in seasoning, lower heat and simmer until preferred consistency. Set aside to cool down and ready to use. Ever made the steamed variety? I'm trying to find out how to make my steamed buns appear whiter. Yours look delicious, by the way. My friend tried this recipe to steam Cha Shao buns. very yummy. Looks incredible. I am going to try them with traditional BBQ Pulled Pork sometime soon. The buns look very tempting. incredible! it looks delicious i will try making this! Simply cover the bowl with a towel. Leave the ingredients rest for 10 minutes. How does the boiling water not kill the yeast outright? Put sugar into boiling water first and mix well. Then add milk and oil, stir for a while. Wait until the temperature of mixture goes down to 40C, add yeast. That'll be okay for the yeast and won't kill them. My buns were very soft after baking. That means they were not killed at all. Thanks for your question anyway. I've updated the recipe to avoid the confusion in this regard. Thanks for this Christine. They turned out great. Have always wanted to find a sauce to put with my bbq pork and this worked wonderfully! Love to hear that you love this recipe. I've browsed your blog and found that you're very talented in baking! Good on you. this looks fab! thanks for the recipe. going to try it out and will tell u if i like it! Your baked char shao bao looks really yummy! Christine, thanks so much for your recipe!, i have made baos with this recipe 4 times now, although i dont bake them as i prefer steamed baos They come out very fluffy and soft. However, and i dont know if i am doing this correctly or not, everytime i steam my buns, there always seems to be blotches of dark spots on my buns when they are done steaming and is not perfectly smooth on top like the ones you would see in dim sums. Any ideas as to why that might happen?? Also, is your dough really wet when you go and knead it?? I get the feeling that slightly moist doughs do better in the oven, and doughs that maybe has JUST enough water or moisture in it might do better in the steamer?? i have made these buns..and they are very yummy! however the pork came out of the buns, how do i actually wrap the pork into the dough carefully so that no sauce can come out? 1. Cook the sauce thicker. 2. Chill the filling in the fridge for an hour or so before wrapping and let the filling consolidate a bit. After steaming the buns, the fillings will be heated and turn soft again. Try either way as you like. As far as whitening, I've never tried it, but I've heard people adding a teaspoon of vinegar to the steam-water before covering. Otherwise you have to find white "Chinese" flour. Yes, this is my old recipe of making buns with plain flour. Recently I changed to use bread flour because I found a place to buy very cheap bread flour. Can I mix ingredients with breadmaker first? I think Brenda asked the same question but I don't think you answered, Thanks!! Breadmaker is good for kneading. Yes, you can use a breadmaker for mixing ingredients.Sorry for missing the question unanswered. When you mention corn flour for the seasoning do you mean corn starch? Yes, we call cornflour, that's corn starch called in US. The recipe makes 6 buns. It is a perfect portion to try out the recipe. I can't wait to try it. Thanks for sharing Hong Kong Chinese recipes. You can make 8 to 10 smaller buns. It's up to you. this bun looks so airy and the recipe seems easy to follow! was just wondering if you need to let the dough rise for a second time after adding the filling and before baking? ur egg tart recipe was amazing btw. custard and tart were both PERFECT! I didn't have my dough got a second proofing when used this recipe. Just popped it in the oven after wrapping the filling. You might like to proof it for a second round anyway. 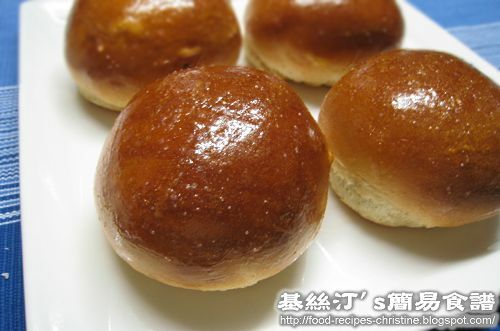 Christine, have u tried making this bun using tangzhong? I have been making them the same way as u do and hv read abt tangzhong recently... so tot it might work... wat do u think? I thought of trying to use tangzhong to bake these buns before. It should be great. I'll try when my family craves for some char siu buns. Everytime I make this it always ends up AMAZING!! Well instead of making with bbq pork I made it with HAM AND CHEESE! IT WAS REALLY REALLY REALLY GOOD and its always gone as soon as I get them out of the oven! LITERALLY! Thanks for the recipe! I used brwon onions for making the fillings. Can you freeze them after baking? What about before baking? You can chill or freeze them. But wouldn't be as good as freshly baked. Excellent recipe!! Tried steamed and baked using the same dough recipe and both turned out very good. Thank You. Love this recipe! Its now my go to bun dough recipe. We also make variations eg using teriyaki chicken instead of pork and it works just as well. Also we add more vegetables too.